Despite having been at the Garvel yard in Greenock SD SALMAID during May, after running trials she returned a few days later to the drydock for further attention. Since then, she has remained in the Great Harbour just a few yards upstream. On Monday afternoon, she ventured out as far as the Ashton Buoy on further engine trials, before returning to her base. The appearance of this vessel has been altered considerably with the removal of the white band around her hull, and the former 'A187' pennant number that she carried previously. and that red funnel!! Whats that all about? 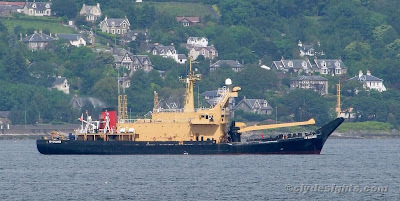 She, like most of the Serco Denholm fleet, were given red funnels when SD took over from the RMAS. The red reflects part of SD's heritage, as that was the funnel colouring used by the Denholm shipping company, one of Glasgow's oldest firms. Reflects SD heritage - they have no heritage just some ex Denholms has beens reflecting days gone by with a crappy funnel that spoils colour scheme of these vessels.